Title: 11/09/1999 - OSHA will not currently pursue a national MSDS repository. Thank you for your letter of September 5, 1999 to Charles Jeffress, Assistant Secretary, Occupational Safety and Health Administration (OSHA). 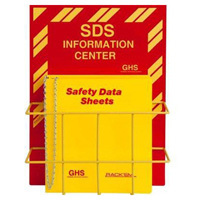 Your letter discusses the creation of a centralized system for creating and storing Material Safety Data Sheet (MSDSs). Your concern was referred to OSHA's Directorate of Compliance Programs for a response. We understand your concern regarding a standardized format for MSDSs. In our most recent directive for the Hazard Communication Standard (HCS), CPL 2-2.38D, OSHA recommended the use of the American National Standards Institute (ANSI) standard Z400.1-1993 for the preparation of MSDSs. However, OSHA cannot presently mandate one format as the HCS is a "performance-oriented" standard. That is to say, we require certain information on the MSDS, but manufacturers, importers, and distributors are allowed to determine the format in which this information will be presented. You should be aware that there is an extensive international effort underway to develop a globally harmonized system for hazard communication, including a uniform format for MSDSs. The United States is an active participant in this process, which should lead to an agreed-upon global format. There are several sources on the Internet for obtaining MSDSs and other chemical information. On the attached page, we have included web addresses for some of these sites. This list is not comprehensive, but may assist you in finding further information regarding a chemical of interest. There are approximately 70 million MSDSs nationwide and the logistics involved in organizing and accurately maintaining one site for MSDSs would be overwhelming. Additionally, MSDSs are intended for use by employees in the workplace; they were not intended to be documents of public information and some manufacturers may consider the information on their MSDSs proprietary. Thank you for your interest in occupation safety and health. We hope you find this information helpful. Please be aware that OSHA's enforcement guidance is subject to periodic review and clarification, amplification, or correction. Such guidance could also be affected by subsequent rulemaking. In the future, should you wish to verify that the guidance provided herein remains current, you may consult OSHA's website at http://www.osha.gov. If you have any further questions, please feel tree to contact of Health Compliance Assistance at (202) 693-2190.